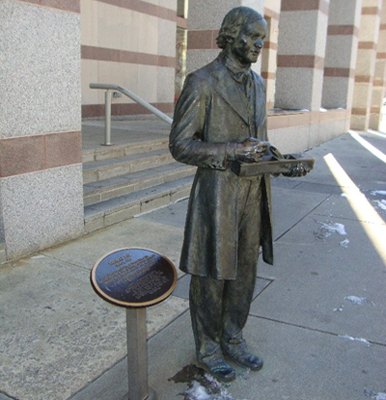 The statue depicts Thomas Day holding a woodworker's plane with both hands. He is shown dressed in a suit (slacks, shirt, vest, tie) and coat. A small plaque and pedestal stand to the left of the statue and contains information regarding Thomas Day as well as the statue itself. THOMAS DAY / (1801-CA. 1861) / SCULPTOR'S REPRESENTATION OF THOMAS DAY, A FREE / AFRICAN AMERICAN IN CASWELL COUNTY WHO CREATED FASHIONABLE / FURNITURE AND ARCHITECTURAL ELEMENTS BEFORE THE CIVIL WAR. / IN MEMORY OF DELLIE HARDISON SMITH, DEDICATED LEADER OF / NORTH CAROLINA ARTS AND HUMANITIES. The text also appears below the main inscription in braille. Thomas Day is considered one of the greatest furniture and cabinet makers of the antebellum period. During his upbringing, he was educated by private tutors and apprenticed under his father, John Day, Sr.
Due to both his professional and social success in Milton, North Carolina, Thomas Day was able to gain support from a number of prominent white community members to relocate his wife, Aquilla Wilson, from Virginia despite a standing law that prohibited free African Americans migrating to North Carolina. Although he was a free African American, he employed both black and white, free and enslaved, in his Milton furniture-making shop. In 1850, he was said to operate the largest cabinet shop in the state and had successfully mechanized his operations through the use of steam-powered equipment before his 1861 disappearance from records. This is believed to have been the year of his death. The statue is located on the steps leading up to the North Carolina Museum of History (located off of Edenton Road). Two other statues - to Sauratown Woman and to Frederick Augustus Olds - greet Museum visitors. The statue stands between the entrance to the Museum of History and the planters which line the museum's front. It is surrounded by concrete steps.